Tesco Store in Waltham Abbey has set up a bookcase to sell secondhand books, which are donated by the public, to raise funds for local charities and organisations. Each month they make a donation to a nominated good cause. Local charity Waltham Abbey Youth 2000 (WAY 2000) was delighted to learn that they were the beneficiary of the sales in September. Elaine Fletcher, Chairman of Trustees at WAY 2000, thanked Michele for the continuous support WAY 2000 receives from Tesco Waltham Abbey which includes donations of cleaning materials and the donation of a Christmas Hamper for a Christmas Raffle to raise funds for the Charity. Waltham Abbey Youth 2000 based in Brooker Road Waltham Abbey has been providing facilities for the young people of Waltham Abbey for almost 24 years. Yip Yop Youth is a club for ages 7 to 11 and is held on a Thursday evening from 4.30 p.m. to 6.00 p.m.
New Images is also held on Thursdays from 6.30 to 9.00 p.m. This is a club for school years 7 to 11 and includes WAY2ART which is a newly formed facility that has been developed as a result of the Tesco Bags of Help Scheme which local people helped to raise £2000 for the club with their blue tokens. The clubs offer a wide range of facilities and activities for young people including table tennis, table football, air hockey, pool tables, computer games as well as arts and crafts. There is a Television room where the young people can chill out and a range of refreshments are also available. 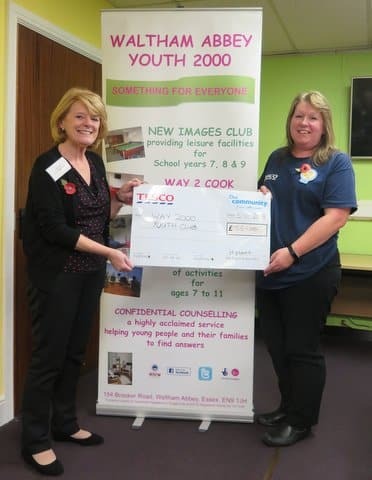 Local support such as that received from Tesco is invaluable to the Charity to supplement grant income to ensure that new facilities can be developed from the aspirations of the young people.